Here we describe how to setup WhatsUp Gold with SMSEagle for SMS notifications. WhatsUp Gold integration uses Email To SMS plugin (see details: Email To SMS plugin). E-mail actions can be defined to launch an external application when a state change occurs. From the WhatsUp Gold web interface, go to Admin > Actions. The Action Library appears. Click New. The Select Action Type dialog appears. Select E-mail Action, then click OK. The New Email Action dialog appears. Name. Enter a unique name for the action. This name displays in the Action Library. Description. (Optional) Enter additional information about the action. This description displays next to the action in the Action Library. Complete the information on the Configuration tab. This tab contains options pertaining to the action e-mail destination. SMTP Server. Enter the IP address or Host (DNS) name of your e-mail server SMTP mail host (you can use SMSEagle as SMTP server). Port. Enter the port number on which the SMTP server is listening. Timeout (sec). Enter the length of time WhatsUp Gold attempts to connect to the selected device. When the time you enter is exceeded without connecting, a timeout occurs and WhatsUp Gold stops trying to connect to the SMTP server. This is considered a failed connection. Mail From. Enter the email address you want to appear in the From field of the e-mail that is sent by the Email action. The authentication type is not configurable. It is negotiated with the SMTP server automatically. Username. 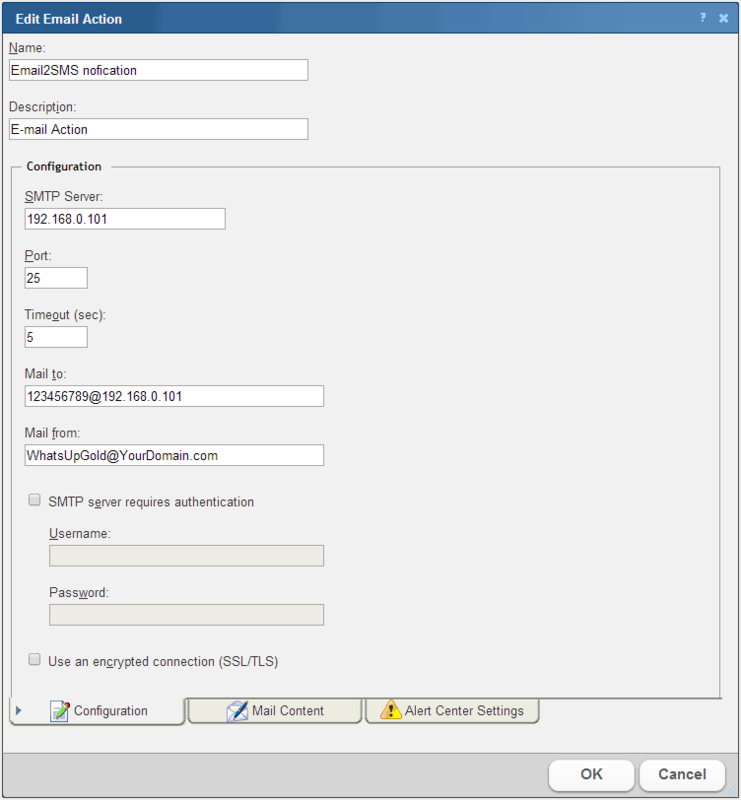 Enter the username for SMTP authentication. Password. Enter the password of the username for authentication. Use an encrypted connection (SSL/TLS). Check this option if your SMTP server requires the data to be encrypted over a TLS connection (formerly known as SSL). Complete the information on the Mail Content tab. This tab contains options pertaining to the action email message content. Subject. Enter a text message or edit the default message. You can use percent variable codes to display specific information in the subject. Message body. Enter a text message or edit the default message. You can use percent variable codes to display specific information in the message body. Complete the information on the Alert Center Settings tab. This tab contains options pertaining to the message sent from WhatsUp Gold Alert Center. subject in the e-mail that is sent by the Alert Center notification. This subject can include percent variables.Tip: To include Alert Center percent variables, right click inside the box. Alert Center Link (uncheck this option). Important: The address you enter here must be the exact address of the Alert Center home page to which you want to connect. Verify the address and enter its exact contents in the above options.